Knowing how to safely operate a pneumatic tool, which is run on compressed air, is very critical. This is for the reason that compressed air can be dangerous, especially in tools such as drills, jackhammers, and pneumatic nailers. Extra caution should be observed as accidents involving pneumatic tools can occur if proper safety measures are not followed. 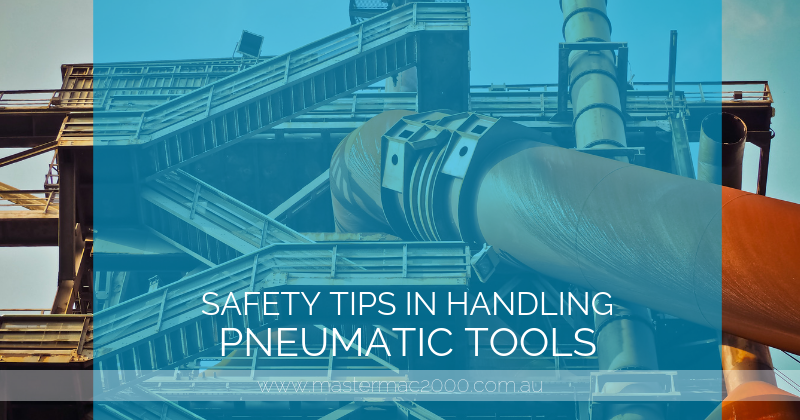 For everyone’s safety, here are tips to remember when handling pneumatic tools. Before you begin operating your chosen tool, read the instruction manual completely. Regardless of the idea that you have previously operated a similar tool, it is still best to understand how it works, especially when the risk of injury and damaging the tool are concerned. Always use safety glasses/goggles, gloves, and other safety equipment whenever it is appropriate. Before you allow others to use your tools, inspect if they are wearing the right safety gear. With this, accidents and possible liability suit are prevented from happening. When using nailers and staplers, refrain from pointing them at another person to not cause any harm or injury. Make sure that others are safe while you are using the tools. Consider setting up safety screens to protect others from flying debris and dust. Don’t let your tools get jammed or clogged. Clean and oil them regularly. Avoid using any attachments that are not compatible with the pneumatic tool you are currently using. Don’t force a tool to accept an attachment that is not intended for a specific use. Remember not to use a tool at an air pressure that exceeds the maximum limit that was specified by the manufacturer. To not create hazards, do not place the air hose in areas that have rough objects such as in walkways. Also, when operating a pneumatic tool, don’t use the hose as a handle. And if you are done using the tool or switching to a different tool, always remember to shut the air off. Avoid using mismatched hoses and fittings; instead, check the diameters carefully. Inspect damages in the hoses more often. If found that there’s a bad hose, replacing it with a new one is the best thing to do and should be done immediately. And before connecting the air hoses, hold the line away from you and blow it out. Keep in mind to only employ hoses that are made for pneumatic tools that are highly flexible and can withstand breaking. If you want to learn more about such tools, keep updated on Mastermac2000.com.au.